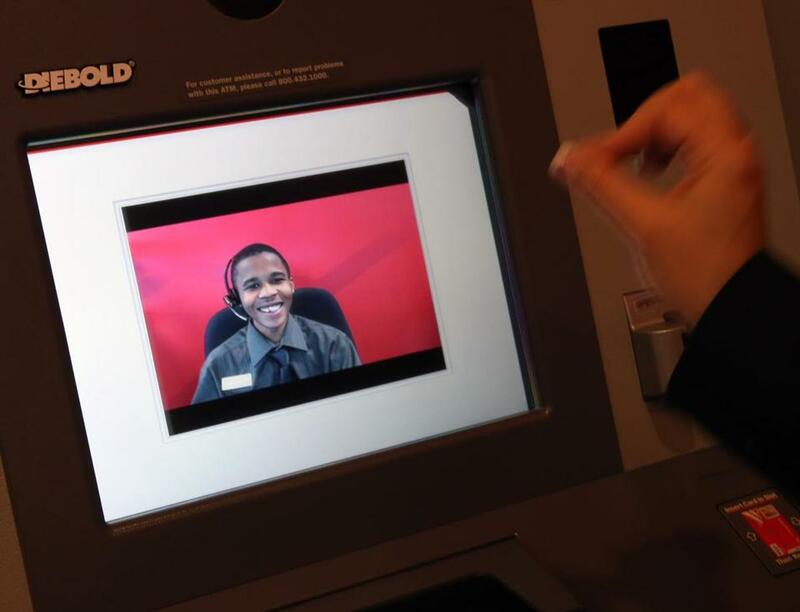 Bank of America customers using the new machines get to chat with tellers who may be hundreds of miles away. They let customers chat with tellers hundreds of miles away via video, dispense cash in denominations from $1 to $100, and even take out money without a bank card. But will this new generation ATMs become as ubiquitous as its predecessor and replace the traditional teller counter at the bank? At four Boston-area branches, the first tests of Bank of America’s interactive automated teller machines are underway. The nation’s second largest consumer bank installed the updated ATMs over the summer in Boston, Cambridge, and Wakefield.The bank is conducting a similar experiment in Atlanta and will be rolling out the advanced ATMs in Charlotte, Dallas, Houston, and Jacksonville, Fla.by the end of this year. At Bank of America’s Back Bay branch last week the new machines, called Teller Assist, were more of a novelty than a necessity. 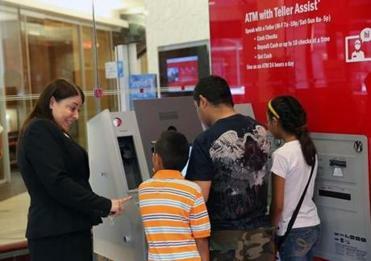 Bank of America has more than 16,300 ATMs nationwide but only 34 are Teller Assist machines. After decades of using technology to reduce staff, especially tellers, the new ATMs bring back the human touch, though in a small-screen version. The video tellers are housed in New Jersey, Delaware, and Florida, and pop-up on the screen to guide customers through deposits and withdrawals, answer any questions, and even allow them to make transactions with just their driver’s licenses. Bank of America’s Jo Sears helped a customer navigate the new Teller Assist machine recently. But for now, the innovation of video tellers isn’t enough to lure customers to the new machines. At the Back Bay branch, bank employees were assigned to the ATM lobby to demonstrate the advanced features and coax customers to try theoversized gray machines. Chandra Williams, 43, of Boston, first headed to old, familiar ATMs, but at the urging of a bank employee, tried out Teller Assist to deposit a check. At first she had difficulty hearing the teller over the phone receiver used with the video link. But after a few minutes she was able to finish her transaction. “It was pretty cool,” said Williams, adding that it would allow her to avoid going inside the bank and waiting in line. Bank of America is still tweaking the machines, adjusting features such as the volume on video conferences and adding new options for customers, including the ability to split a deposit between two or more accounts, said Jody Blatman, a senior vice president for retail banking in Greater Boston. The video teller technology is likely to catch on in a year or two as customers realize that these machines extend the bank’s hours into the night and through the weekend, said Ed O’Brien, a director at Mercator Advisory Group, a Maynard payments and banking research firm. At Bank of America, customers can talk to the video tellers until 10 p.m. on weekdays and from 8 a.m. to 5 p.m. on the weekends. Bank of America plans to install more of the Teller Assist machines next year. NCR Corp. of Duluth, Ga., which is one of the manufacturers of the video ATMs for Bank of America and other financial institutions, said its machines are now operating in 20 states, said Jeff Dudash, a company spokesman. Some banks are replacing drive-through tellers with the new ATMs, while others are using the machines to expand their reach into new territories without having to lease space for a branch, Dudash said.